Lerner Interactive Books are amazing for tons of reasons, but here are the top two: 1. They help readers of all levels improve their literacy skills. 2. Readers are exposed to engaging and educational Lerner content! You may be aware of our iBooks, but are you aware of all of the great content they feature? This week’s spotlight is shining on the new Cloverleaf Books™ Community Helpers series. So many people help out in our communities! In these books, young students talk with different community helpers to find out what they do, what skills and training they need, and how their work benefits people in the community. 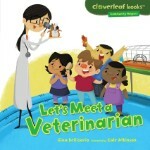 Let’s Meet a Veterinarian What does a veterinarian do? Let’s find out! Dr. Kate is a veterinarian. She visits a school to give Henry, the class guinea pig, a checkup. She shows the class the tools she uses. She tells them about the many things vets do. And the students learn how to take good care of Henry. Hooray for veterinarians! Let’s Meet a Construction Worker What do construction workers do? Some lucky kids are about to find out! They visit Mr. Moore, a construction worker who’s helping to build a new school. He shows them machines that dig big holes. He explains how he follows the building plans. And he tells about different workers and how they stay safe. Hooray for construction workers! Let’s Meet a Dentist Have you ever had a toothache? Or gotten your teeth cleaned? Dr. Florez could help you out! She’s a dentist, and today she has an office full of curious visitors. They try out her dentist’s chair and look at X-rays of teeth. They also learn how she helps patients keep their teeth clean and healthy. Hooray for dentists! Let’s Meet a Doctor What does a doctor do? These kids have a few ideas. But to learn more, they talk to Dr. Zambil. He tells them how he helps sick or hurt kids feel better. He sees healthy kids to help keep them healthy. He even helps train new doctors. Let’s hear it for doctors! Let’s Meet a Firefighter Are you curious about fire trucks? Firefighting clothes? Hoses and ladders? You’re in luck! Firefighter Jim works at the fire department. He knows how to handle all kinds of emergencies. He shows a group of kids how he does his job. Let’s hear it for firefighters! Let’s Meet a Librarian Are you curious about dinosaurs? Music? Volcanoes? You’re in luck! Mr. Field is a librarian. He knows how to find information about all kinds of cool things. He shows the students in Mrs. Ríos’s class how to use the library. Let’s hear it for librarians! Let’s Meet a Police Officer Do you want to learn more about police cars? Police dogs? Other tools the police use? Then it’s your lucky day! Officer Gabby is a police officer. She knows how to keep people safe. She shows a group of kids how she does her job. Three cheers for police officers! Let’s Meet a Teacher Whiteboards, computers, and stickers. What do these things have in common? They’re all tools Ms. Crawford uses in her job. Ms. Crawford is a fourth grade teacher. She invites a group of students learning about community helpers to visit her classroom. She shows them the many ways she helps her students learn. Hooray for teachers!